The images of flooding in Colorado over the past couple of days have been saddening to see unfold. While our region has seen some rather prolific rainfall this summer in places...and flooding to go along with it...imagine the thought of picking up a summer's worth of rain in just a day or two. That's what's occurring in the foothills surrounding Denver. Some places have picked up over a foot of rain in just the last three days, places that in a year average around 20 inches of rain total. Doppler radar estimates through this morning (see below) show the squeeze play of heavy, heavy rains across Denver and places to its north and northwest, which has resulted in some rather impressive flooding. Even in Philadelphia's eight inch rain event last July...that only accounted for two months of Philadelphia's average rainfall in the summer. While some summers obviously produce less than eight inches of rain, our region averages more than twice the annual rainfall that Denver does. The scope of flooding there, especially given a hillier terrain, can be a bit more catastrophic and sudden than what we see around here. The culprit behind this are three features working in tandem. One, an upper level low over Nevada has been pulling moisture northward from the Pacific over Colorado, adding humidity to the atmosphere. Second, a surface and low level high pressure system in the Plains parked over Minnesota is providing an easterly surface wind across Colorado, helping to put a "squeeze" on moisture along the front range as it pushes up against the Rocky Mountains, which reside just to Denver's west. 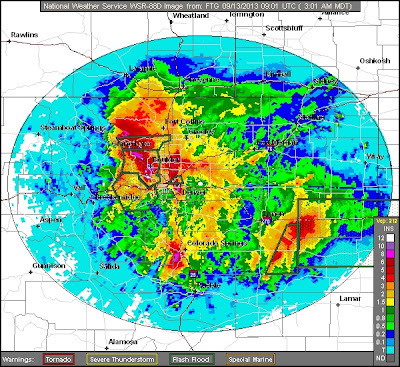 The graphic below shows Interstate 25 going relatively close to north to south across the middle of the map. The Rockies are to 25's west, with the High Plains to its east. The triggers to put all of this together to produce the rain are relatively "weak" disturbances in the atmosphere that track northeast around the mid level flow of the upper level low in Nevada. This results in the trigger that produces the prolific rains over the region as the surface upslope lifts into the unstable atmosphere can causes rain. If this were a more typical upslope scenario for Denver, the rainfall amounts would be less prolific but the addition of deep tropical moisture from the Pacific Ocean and the slow moving nature of the pattern is yielding the results that we've seen unfold over the past couple of days out there. Usually the atmosphere kicks these upslope scenarios along a bit more rapidly...and even when things are bogged down, there isn't quite as much moisture to work with. Around here, the change in elevation between east of the "Fall Line" and west of it can account for a rainfall maxima to develop across the western and northern suburbs in heavy rainfall events. While the elevation change here is less significant than it is in Colorado, only on the scale of 400-500 feet between the Delaware River and Chestnut Hill and Wayne, it is just enough of a lifting mechanism to enhance the production of rainfall in heavy rainfall events around here. 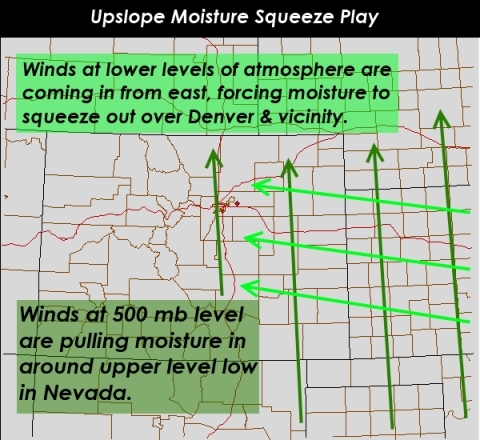 With the Rockies providing a more substantial boundary, the scope of upslope rains in the setup that Denver's been experiencing since Tuesday has been quite significant.